My first year to be retired for the holidays & I'm still behind--haha! Love your card--hadn't seen that die before! Hopefully I'll get something made for the challenge & I'll play for the prize this time. Good luck in the extra RD challenge! Maybe next year I'll get something entered every month. A brilliant idea for using this die with four cards at the end as well - great explanation too. A fabulous card and a great die too. I'll be in the playground later and would love a chance to win this week's prize please. A fantastic idea Di and quick to make too. Playing for fun this week. Great idea and beautiful colorful card! Fantastic set of cards and great use of that lovely die. I entered and yes for the prize,thanks! 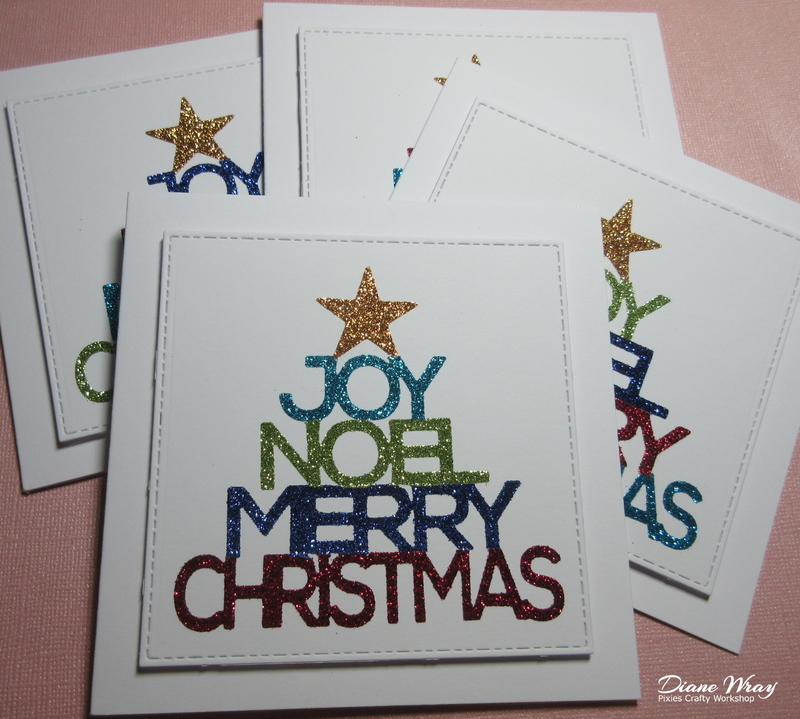 ooh lovely bright glittery cards and I can see how you ended up making four, one of those dies that just keeps giving LOL! I love lil inker dies they are so versatile so I will definitely be back to play to be entered into the draw. 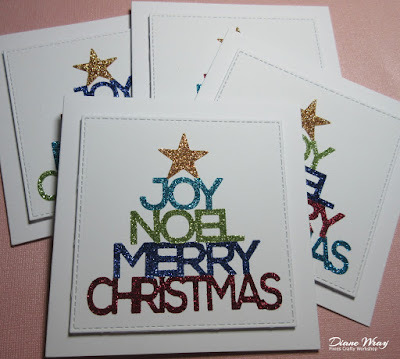 Love these cards Di, they look fabulous in all the different coloured glitter card, brilliant idea. all the words to put together four trees. They look perfect! And yes, please, I'd love to play! Last minute panic indeed. I'm there (in panic mode) already. Your sparkly card is wonderful, and the idea of making 4 cards in the color combo is genius. Yes please for the draw. Eeek! You are certainly right about my being in a panic mode right about now because I am so far behind with my holiday shopping and preparations. We've had family visiting, bridal and baby showers, birthday parties and everything in between. I love your beautiful glittery card design and aren't you the smarty pants in using four different versions to combine in unique ways! Yes please to the prize draw. Off to try to make some gift tags..oh my! This die has a great design and it is great using it for snippets and making 'quick' cards! I always save snippets of white cardstock and look what I did with them! A lovely card Di, such a great die you have used, something a bit different! Please add my name into the draw, thank you! Ages since I have joined in here - must remember to keep looking! That's a super die - would love to win it!! Love what you did with the die - can I say a yes please? In haste Mis, sorry, yes please to die and Love card for snippets what great way to use ‘em up. Hello Di. Love your sparkly set of cards. Working with glitter scares me, but glitter paper and glitter pens are the only ways I will add glitter to my projects. That word tree die is cute, so yes please. Oooh I love this Di! It looks fab with all your lovely sparkly papers - yes please to be in your draw. Fabulous cards Di! Please include me in the draw. I just linked #33... and am wowed by the entries made by others during this busy time of the year! Also, I would love to have that wonderful die if Mr. Random picks me! Oh dear oh dear. The last time I played was back in July. I must try and do better. Just playing for fun . Hugs Mrs A. Such lovely creations. Playing after a long time and a Yes from me! amazing set of cards and I love your card which arrived at our home, thank you so much! wishing you a happy holiday season :). What an awesome set of cards....thanks for offering that beautiful die. I entering my snippets card just now because I would LOVE that die. Thank you and Merry Christmas! Gorgeous, colorful and so sparkly Di, love it! And Yes I love that fab die!